Science is fundamental to understanding life, the universe and everything. It encourages everything from our everyday life to our wildest dreams and captures our imaginations. The ability to master the core science skills enables students to make sense of their surroundings and allows them to see the world through a questioning, scientific eye. The key stage 3 Science curriculum is skills based and follows on from the work started in key stage 2 and allows pupils to develop their skills in planning, developing and reflecting as set out in the Welsh Assembly Government’s National Curriculum Framework. Practical work is a key feature of science and all pupils will be given opportunities to develop their knowledge through scientific enquiry. Progress is monitored through regular assessment tasks. Lessons are fully differentiated to allow each pupil to make progress. Extra support is given to those pupils who require it and extension activities are offered to the more able and talented. Pupils are also encouraged to develop their literacy skills through extended writing tasks. The school has built up links with several external agencies, such as, Techniquest and Aerospace. In year 7 the pupils are taught in mixed ability groups. Topics include: Laboratory safety, practical skills, cells, organs and tissues, healthy eating, solids liquids and gases, elements, compounds and mixtures, electric circuits and energy transfers. In year 8 the pupils further develop the skills learnt in year 7. The more able and talented pupils are put in the same class to enable them to work towards achieving the higher level skills. All the other groups are taught as mixed ability. Topics include: Measuring skills, food webs, organ systems, chemical changes and reactions, sustainability, energy resources and how things work. In year 9 those pupils likely to achieve high levels (6+) are taught in 2 classes. The other classes are taught as mixed ability (levels 4-6). The emphasis throughout year 9 is on developing the skills required for the end of key stage 3 assessment. Topics covered include: The effects of human activity on the environment, The application of science and technology, kinetic theory, acids and alkalis, thermal energy transfer, energy and power and electricity. KS3 science education is also supported and extended by a popular STEM club which runs every Tuesday after school. Miss Murray (science) and Miss Wright (maths) offer exciting activities, encourage group work and involve the club in many external competitions and trips. Science at KS4 offers multiple pathways to suit the needs of all of our learners. All KS4 classes are taught by specialist teachers who have a passion for their subject. At present, Year 10 are embarking on a new GCSE Double Award Science qualification. This is the same course which is being followed by all secondary schools in Wales. They will be awarded 2 GCSE grades of equal value at the end of Year 11. They will be taught lessons in Biology, Chemistry and Physics. There is a high emphasis placed on practical skills within this GCSE. Year 10 pupils are able to opt to take Triple Science. This results in 3 separate qualifications in Biology, Chemistry and Physics. This course is recommended to pupils who have a strong interest in Science, and who have reached level 6+ in KS3 Maths and Science. It is a more demanding course. Currently in Year 11, we are offering 3 pathways. Having already taken Core Science to GCSE in year 10, around half of our Year 11 students will carry on with GCSE and study for Additional Science. This course involves sitting 3 exams and completing an extended controlled assessment. We have 30 pupils who are studying for their Triple Science qualification. Most of these students will go on to study sciences at A Level. They have to sit an extra 3 exams and 2 extra controlled assessments, so it a very demanding course. We are also providing a vocational course for around 60 of our Year 11 learners. This is a widely recognised WJEC qualification called Science at Work. It involves the completion of 3 extended assignments, done in a controlled environment, and one exam. This will allow learners the chance to pass at level 1, 2, merit or distinction. 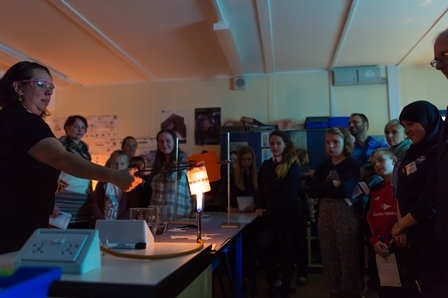 Science at KS4 in Ysgol Clywedog is supported by Attainment Tutors, EAL service support and the increasing use of experts from outside agencies to enhance the learning experiences in the classroom. 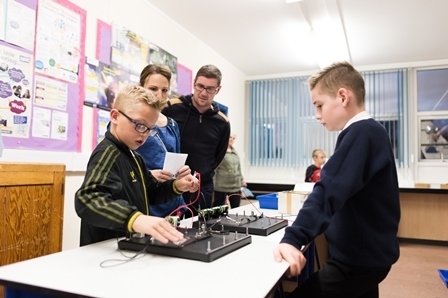 We are constantly striving to meet the changing needs of the pupils in our classes and to instil in them a love of learning and an admiration for the scientific world around them. This year, for the first time, we will be taking 19 Year 11 pupils to Iceland, on the trip of a lifetime. We will explore the vast scientific experiences the country can offer. 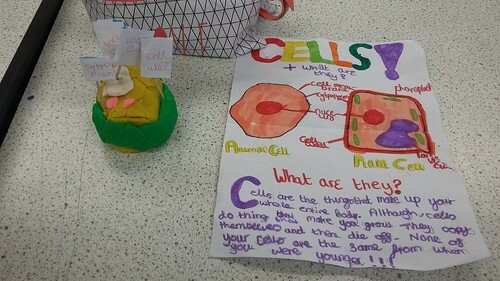 Some examples of superb homework by year 7. Mrs Hope’s class made amazing cells out of jelly, fruit, sweets and lots of other things! Year 9 have been studying the impact of humans and thier effect on the environment. The focus of thier studies was Palm Oil production in Indonesia and Orangutans.